Several months ago, this middle-aged patient came to us in hopes of obtaining a significant improvement in appearance of the frontal hairline. In CIT (Cole Isolation Technique), the physician can selectively chose each and every single donor FU (follicular unit), allowing for effective management of donor resources while improving the overall aesthetics of the final result. Similar to FUE (follicular unit extraction),this method of hair transplant significantly reduces recovery time, involves less associated pain than follicular unit transplant (strip) technique, and involves less noticeable scarring in the donor area. 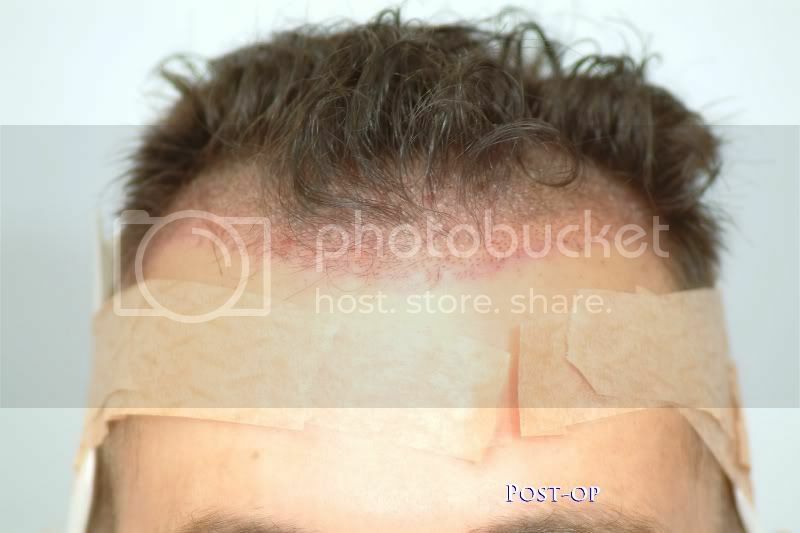 Usually follicular unit transplants involve at least three to five days more than CIT or non-strip techniques mostly because CIT doesn’t require any closure (suturing) devices in the donor area (back of head). 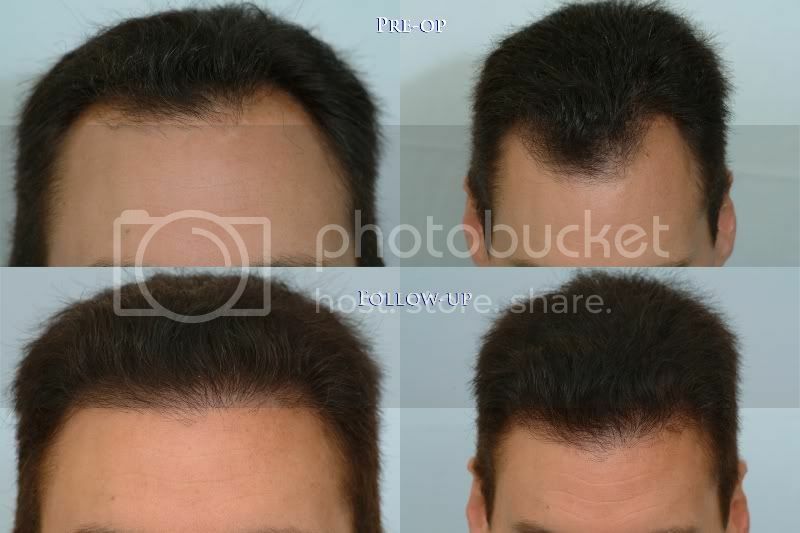 The treatment plan for this patient was to slightly lower the hairline by approx. 2 cm then strategic placement of 1200 CIT grafts to follow. 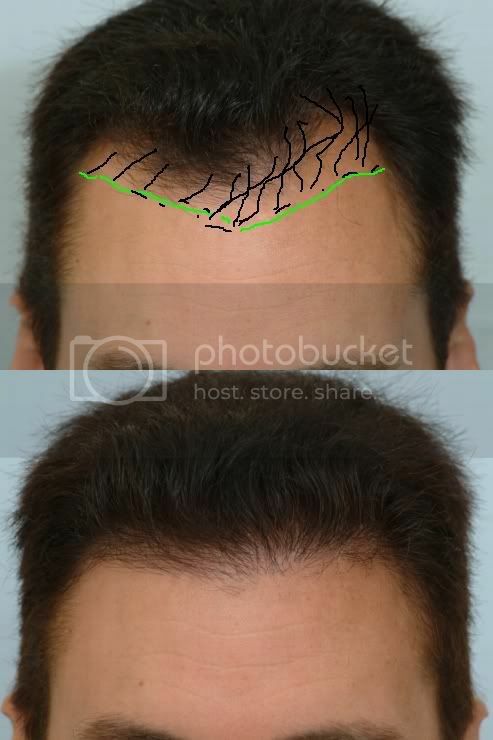 When lowering the hairline, the desired density should be appropriate to each patient’s unique characteristics. A very large number of single-hair grafts make up for the amount of grafts that were transplanted. 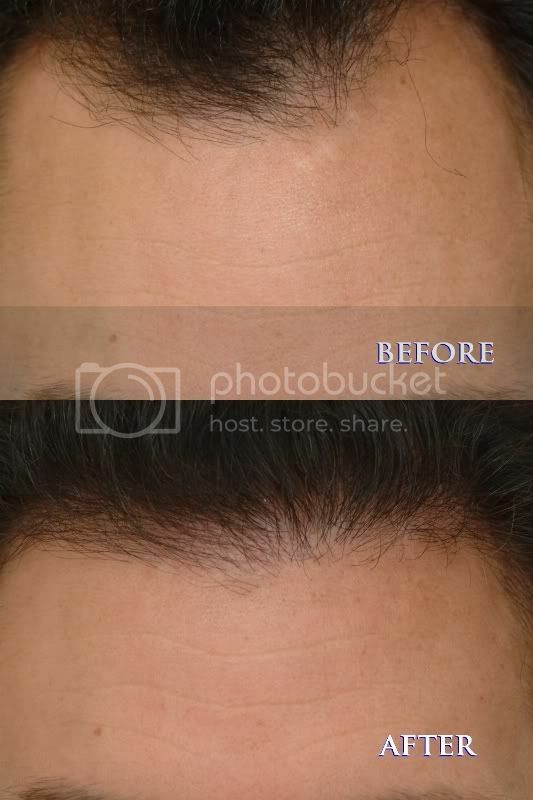 Hairlines should always appear soft, and the procedure should yield natural looking results. 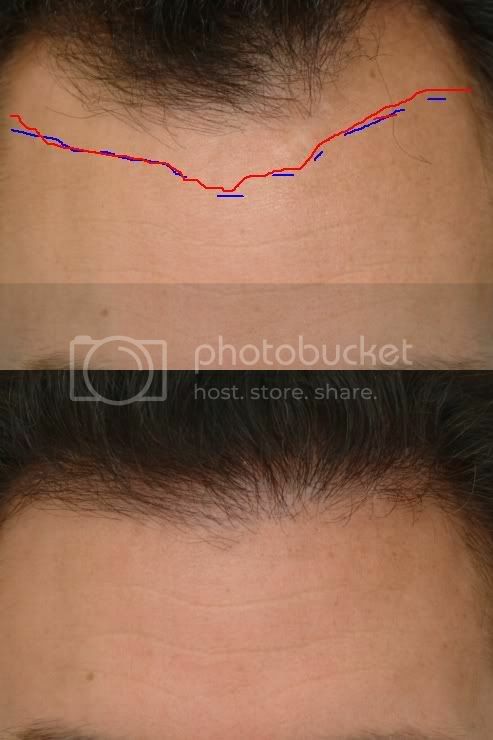 Framing the face is the main purpose for creating each patient’s unique hairline design, but remember, too much density can create problems at a later date. The temples, temporal regions, hairline, and eyebrows are all components that can easily make or break even the best hair transplant procedure. Best of growth to this patient! » obtaining a significant improvement in appearance of the frontal hairline. » (suturing) devices in the donor area (back of head). » procedure. Best of growth to this patient! What exactly are the differences between fue and cit? » What exactly are the differences between fue and cit? To put it simply, CIT (Cole Isolation Technique) is Dr. Cole’s proprietary method of FUE. Like FUE, it involves removing follicular units one at a time and placing them into the recipient areas. Also, as with FUE and unlike with strip procedures, CIT does not leave a linear scar on the back of the patient’s head. When Dr. Cole began developing his technique of FUE, the instruments available for this sort of procedure were minimal and not truly intended for harvesting individual follicular groups. Dr. Cole therefore decided to design and patent his own instruments. His instruments, refined many times over the years, each have special functions and work differently from anything else available. Dr. Cole views his CIT method as distinct from FUE performed by other doctors because it is a highly specialized and refined procedure, with its own instrumentation, based on Dr. Cole’s years of experience and effort to produce consistent results. Some history: Dr. Cole began developing his CIT method in 2002 as a technique to remove individual follicular units. At the time, there was only one other physician in the US actively pursuing the procedure and only a handful worldwide. By 2003, 90% of Dr. Cole’s procedures involved follicular group harvesting. Throughout the years, Dr. Cole has performed well over 2,000 CIT procedures and 90% to 100% of his procedures each month use CIT. What makes the CIT procedure so superior is the number of hairs per graft and the extremely low transection rate. Strip surgeons average 2 hairs per graft whereas, with the CIT method, Dr. Cole averages 2.9 hairs per graft. This means the patient is getting almost one hair more per graft of value for their money, or about 30% more hair in each graft. In a CIT case yesterday, Dr. Cole actually averaged 3.6 hairs per graft. With his method, Dr. Cole can also boast an extremely low transection rate of under 2%. Many strip doctors would not even be able to tell you their transection rate as they only cut the linear strip out and later make the recipient sites, while the technicians do all of the cutting and placement of the grafts. With CIT, the physician is involved in every step and can cherry pick the best follicular units, that will produce an optimal yield. Despite strip-proponents assertions that FUE or CIT procedures are limited to small sessions, Dr. Cole was the first physician in the world to do over 7,000 grafts, all of which were with individual follicular group harvesting. He has done a number of cases in excess of 5,000 and has done many sessions of 3,000 to 5,000 grafts in a single procedure. However, huge sessions are rarely necessary with CIT because, with more hair per graft, superior results can be achieved with far less grafts needed in total. During the consultation, did anyone at your clinic tell him that he doesn’t need hair transplant? I agree, the results are very subtle but likely make a big difference to the patient. He obviously had a great head of hair to begin with but just wanted to restore some of the density around his hairline. I think he looks great! Emilie11 how come Dr. Cole doesn’t do body hair transplant anymore, I don’t mind seeing more beard or body hair work. » mind seeing more beard or body hair work. He still performs body hair transplantation but prefers not to use body hair unless the traditional scalp donor region is depleted. BHT results tend to be more subtle, yield is lower and results are more unpredictable than with traditional scalp hair. Therefore, patient selection and education with regard to yield and cosmetic impact are an integral part of the pre-operative consultation when it comes to BHT. Dr. Cole will only offer large cases of BHT after first testing a small area to see what yield can be achieved and see whether the patient will be satisfied with the result. With BHT, he keeps the density of grafts at or under 30 per square centimeter. While yields in excess of 90% occur with higher densities, Dr. Cole’s studies have shown that yields of only 5% occur above 36 grafts per square centimeter. Next to scalp hair, beard hair typically gives the best results. Unfortunately, we don’t have a large gallery of BHT patient results, as these patients are less apt to consent to photo releases. » » mind seeing more beard or body hair work. » centimeter. While yields in excess of 90% occur with higher densities, Dr.
» these patients are less apt to consent to photo releases. Emilie what do you charge these days? I have a fella in NYC that needs a minor touch up in his hair line for the feather-like appearance to make look more natural using nape hair. My guess is 300-500 nape grafts. He had a procedure 10-12 yrs ago using strip but would like to close a few small gaps and make more natural the hair line.